Teachers at Shelby County West Middle School in Shelby County, Kentucky, know that when their students aren’t in school, they might not be getting enough food. 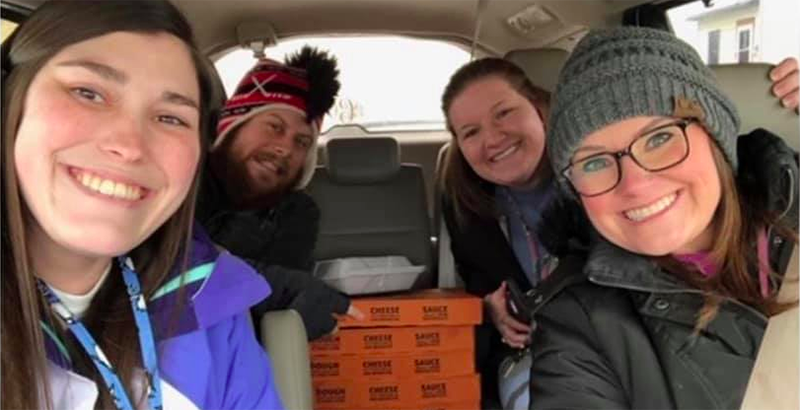 So when frigid temperatures led to school-wide closures two days in a row, a team of educators brought food to their shut-in students. Though Wednesday, Jan. 30, was a snow day for students, Shelby West Middle School teachers were called in to work. According to WHAS-11, it was then that teachers Mary Byard and Melissa Chesterfield recalled the school’s motto: “No burden, no goal, no task or mission will be too great when we are all together” and felt compelled to act. “We already know the burdens of our students,” Byard told the station. Indeed, every Shelby County student in kindergarten through seventh grade gets free breakfast and lunch at school, according to WLKY. Most of them struggle with financial challenges and food insecurity. As WLKY reported, “We were mentioning it’s a shame we can’t just get some materials and make a bunch of sandwiches and go deliver them. And Melissa said, ‘Wait a minute, there’s food downstairs that’s donated. Let’s go make some visits,'” said school librarian Chellie Gaither. The team delivered meals to 11 students and their families on Wednesday. Byard told WHAS that students seemed “shocked” to see their teachers outside the classroom. Afterward, Chesterfield sent a school-wide email and drafted a Facebook post explaining the urgency of donating and delivering food to the students. “I sent an email out to our whole school and said, ‘What if you just went and visited one family, how impactful that would be,'” she told WLKY. By the next day, the teachers had received a flood of donations and delivered meals to more than 30 families. “We have a saying here at West: This year our goal is making waves. So I feel like in a way we made a little wave, and it’s pushing through the whole school spreading a little love,” Chesterfield added.